A small lahar triggered by rainfall rushes down the Nima II River near the town of El Palmar in Guatemala. 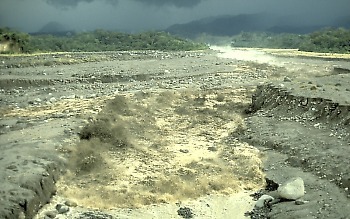 The lahar developed on the slopes of Santiaguito volcano. Credit: J. N. Marso / U.S. Geological Survey. 'Lahar' is an Indonesian word for a rapidly flowing mixture of rock debris and water that originates on the slopes of a volcano. Lahars are also referred to as volcanic mudflows or debris flows. They form in a variety of ways, chiefly by the rapid melting of snow and ice by pyroclastic flows, intense rainfall on loose volcanic rock deposits, breakout of a lake dammed by volcanic deposits, and as a consequence of debris avalanches.